← Was _Your_ Driver’s License Revoked? The Seattle Times this morning published an article on Seattle’s effort to increase cycling safety by installing green lanes — we’re the Emerald City, get it –on four dangerous intersections: Dexter at Denny Way, both ends of the Fremont Bridge, and North 145th where the new Shoreline Interurban Trail meets the city limits. The article goes on at surprising length about the dangers of the “right hook” accident, about Mayor Nichols’ plan to triple cycling trips, and of course, about how we’re keeping up with Portland on the bike safety front (we’re not) by painting these lines.While I applaud ANY efforts to increase the safety of little ol’ me and all my cycling friends, I have to wonder about a few things… First of all, the article leads with a scary story about a close call near the University Bridge at Fuhrman Ave E. They also quote Kent Peterson and a couple other high-profile cycling folks talking about that same intersection. Yet there are no green lanes planned there. The cynic in me wonders if potential pending lawsuits about the Bryce Lewis death are holding up actual action at that location. But mostly I’m wondering what’s up with the green? I don’t understand why we don’t just jump on the bandwagon of cities around the world that use BLUE to mark these very important bike-car intersections? I’m hoping my quip about our Emerald City status wasn”t a driving factor. Hmmmm…. maybe it’s because cycling is green? Or because green means go and tells drivers they have a free pass? Nah, that can’t be it. While I applaud the lanes — with a standing ovation even — I do marvel at how we managed to add our wacky Seattle touch to yet another transportation infrastructure project. Next up? Nobody’s asked me but I hope plans include lane mitigation at the Fuhrman/Bryce Lewis intersection, as well as tackling the most dangerous car-bike intersection in Seattle: Burke-Gilman at Blakeley St. This entry was posted in bigger than here, bikes, Human Powered Politics, PDX, seattle, traffic and tagged bikes, blue lanes, cycling, green lanes, safety, seattle, traffic, university bridge. Bookmark the permalink. I actually don’t care much for measures like these. It does let people be wary of cyclists, but it also restricts cyclists. I think it also gives another crutch to drivers; one less thing they need to worry about, “I don’t have to look out for cyclists crossing the street because they’re in this trusty painted zone at all times!” The real obstacle to cycle-car relations seems to me to be a lack of defensive driving on both ends, mostly on the car end because a bicyclist is manually operating his/her vehicle. Thanks for the tidbit, thanks for hearing my comment! Nice article Tim! I like the photo. 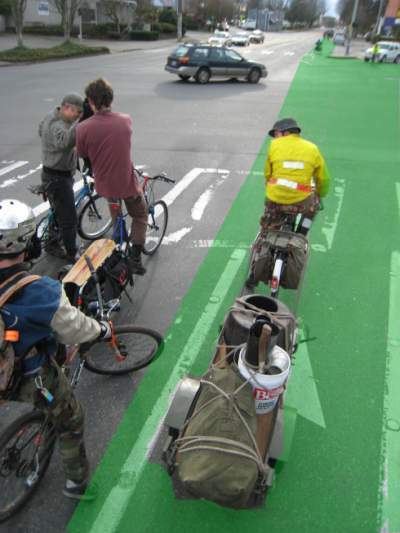 It sounds like PDX will be doing green lanes too in the future, although I can’t imagine why they’re changing. Thanks Dave — I saw that about PDX. I can’t imagine why either, and with their powerful bike lobby I think I’ll believe the change when I see it. I guess green is better than nothing — that’s what they are using in Brooklyn — but it still strikes me as trying to “buck the trend” in a Seattle kind of way. Marge – I wonder of underground is an option there — they could have had the new developer put in a tunnel while they are digging their big hole. I think one option there would be a signal like they have a Pike Place Market — ALL car traffic stops then ALL crosswalks turn. It allows people to go diagonal or merge into a lane of traffic from the trail or whatever. Then the cars get their chance. Why not paint them red, as a warning to cyclists? Bike lanes may be less evil than stronger methods of separating road traffic from other road traffic but they do create problems that we wouldn’t have without them. Plus, I’m still waiting to see a single advantage (from the cyclists’ point of view). Bike lanes suggest a ghetto for cyclists; they may provoke dangerous ways of driving such as driving too close to parking cars; they require a lot of maintenance where cars clean the road by just using it; and you already mentioned the right hook issue. I feel they really do nothing good except for being a political demonstration that cyclists are there and are acknowledged. What you may get in the end is just mileage appreciation: celebrating so-and-so many miles of new bike lanes regardless of their quality and safety. This works the better the more visible the lanes are, as it is hard to celebrate something nobody really does notice. Over here in Germany we increasingly fight against separation of bicycles from other road traffic. History, people’s attitudes and the legal framework are quite different, but the underlying concepts and forces may be similar. Or maybe not: you seem to have public debates on the safety and convenience issues, something we largely lack.